His Highness Sheikh Sabah Al-Ahmad Al-Jaber Al-Sabah is the Emir of Kuwait and the Commander of the Kuwait Military Forces. He was sworn in on 29 January 2006, after confirmation by the National Assembly. Sheikh Al-Sabah has pursued a policy of reform. His government appointed Kuwait’s first woman minister and he introduced laws, which facilitated the entry of foreign investors to the country. He is well known for his considerable experience in the field of foreign policy and diplomacy. For around forty years, His Highness’s name and image have been inextricably linked to that of the Ministry of Foreign Affairs. Although he has occupied a number of other positions, it is for his work at the Ministry of Foreign Affairs that he is most renowned for. Many diplomats who were contemporaries of His Highness emphasize his determination in developing Kuwait’s foreign relations, particularly with regards to the Permanent Members of the Security Council. He strongly believes in tolerance, diversity and the necessity of cultural integration, not cultural conflict. 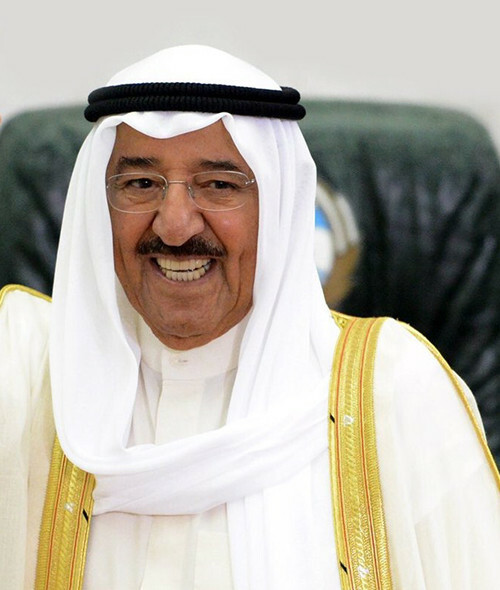 Despite the challenges he has faced, His Highness has proved time and time again his immense ability in the twin fields of Kuwait’s Domestic and Foreign Affairs. His political strategy was centered on helping Arab countries, this often took the form of providing loans to needy states. He also took on conciliatory and mediatory roles during regional and Arab conflicts. He is a firm advocate of the power and importance of Arab unity in overcoming conflict and disagreement. His Highness the Amir condemns terrorism and stands against the Western media’s portrayal of Islam as a religion that encourages terrorism. Instead, he is determined to ensure that Islam is seen for what it is - a faith of tolerance, magnanimity, and kindness. He succeeded in obtaining international support for Kuwait after it was aggressively invaded, which resulted in the Security Council issuing decision N678 on 29 November 1990. In 2014, the Arab Family Organization named His Highness the “Arab World Humanitarian Personality of 2014”, and the United Nations Organization dubbed him leader of the humanitarian world. His leadership is known mostly for its diplomacy and humanitarian effort. On March 2017, he was awarded the Honorary Doctorate from Kuwait University for his humanitarian role on the global scale.